I’ve been thinking about point of view a lot lately when I’m not thinking about this dog. Right now, Seva is next to my chair, chin level with my lap, gaze lifted because in the service dog world, eye contact is rewarded. She wants Joe’s Os. The problem is if I type more than a few words between Os, she’s up. On me. On the table. Claws way too close to the laptop. Out come the teeth. 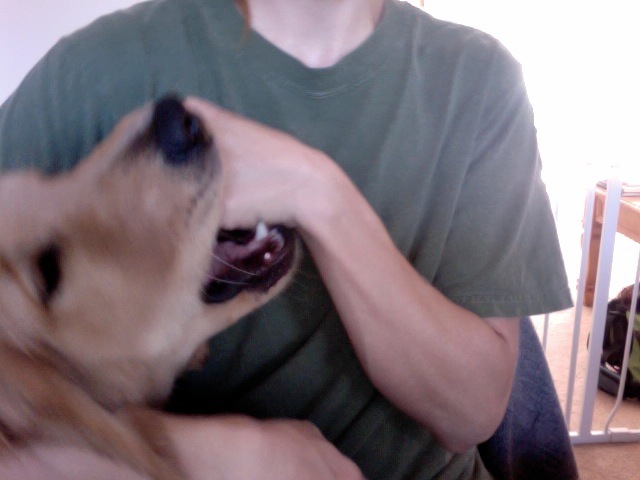 Those baby teeth were sharp, but these chompers can do serious damage and she hasn’t quite figured them out. Overnight her mouth was filled with these unbelievable canines and cuspeds. I would look at her and say, “Why Seva, what big teeth you have!” And she would reply, “All the better to bite to you with, my dear!” And then she would. Just like she is now. I need those fingers to type! Is this the writing life?